A successful estate plan is shaped by goals. Key estate planning goals are minimizing taxes, avoiding probate, retaining control over property, protecting assets, and protecting against incapacity. These goals are represented in the outer rings of the illustration. 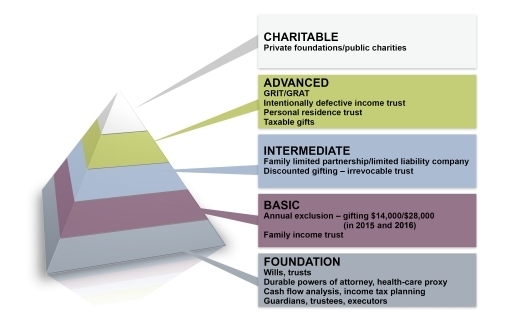 There are a number of devices that can be employed to accomplish these goals; among them are gifts, wills, trusts (living or irrevocable), joint ownership arrangements, and beneficiary designations. These devices are represented within the world's core (the pie-shaped pieces). This tool has been designed to easily match goals with devices that can achieve those goals.